Ana graduated from the University of Leon, Spain, in 2014. After that she completed a one-year rotating internship at the University of Barcelona, Spain. Following on from this she moved to UK and after 6 months working in a first opinion practice she joined the Small Animal Teaching Hospital, at Liverpool University, as an intern in Small Animal Anaesthesia. 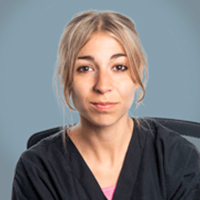 In May of 2018 Ana started as an anaesthesia intern at SCVS.